This Nobili Spa Sun Lamp isn’t just another cheap faucet packed full of LED lights that indicate when the water is piping hot. Instead it’s a kitchen sink that’ll make washing dishes and food a whole lot easier. 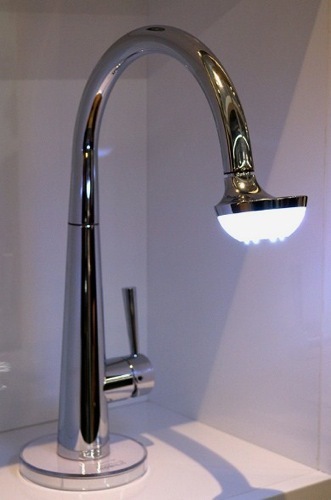 Along with offering you a nice strong stream of water, you’ll get some added lighting right on the end of the faucet. With this you’ll never have to wonder if you’ve missed a spot on one of your pots or pans. The faucet pulls out just like your average sprayer would. Although a light directly over the sink helps a great deal, you still have problems with shadows where you’re left tilting pots this way and that. This sprayer could get up close and you’ll never be left with a dark corner, especially since it features a whopping 30 LED lights. Hopefully the faucet isn’t too horribly expensive, but right now it doesn’t appear that they’re listing a price.